Dufuna-Fem NYSC & Graduates Code Camp aims to empower women and help them start a successful career in the predominantly male tech sector. Based in Lagos and Ibadan, Code Camp is a three-month software engineering training for female university students and graduates. Designed as a self-study programme, participants are granted a monthly scholarship in order to cover internet access costs. Furthermore, participants are assigned a mentor with whom they meet bi-weekly to get advice and track their progress. So far, two thirds of the graduates were placed in an internship or were offered a junior manager position in one of the partner companies. A further expansion of the training activaties is contemplated. Dufuna-Fem NYSC & Graduates Code Camp was initiated in cooperation with local organizations and the Delegation of German Industry and Commerce in Nigeria. The training was funded within an activity of the ExperTS-Programme of GIZ. Australia is supporting the Girl Effect, a UK-based organisation, to help build young women’s leadership, voice and agency in Bangladesh through an innovative research model, Technology Enabled Girl Ambassadors (TEGA). TEGA originated in Nigeria and now has networks in Rwanda and Malawi. 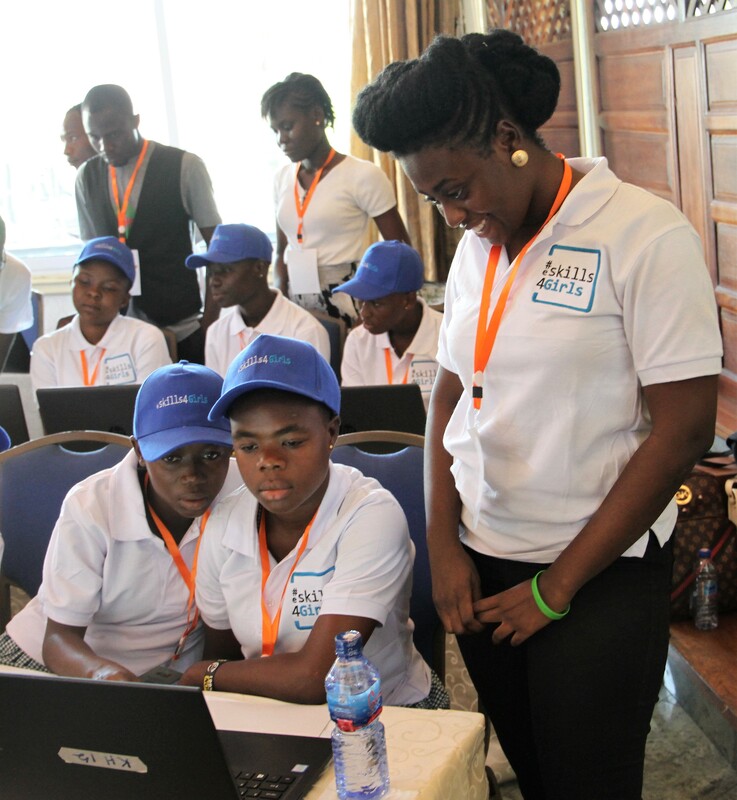 TEGA trains girls aged 18-24 in certified data-collection techniques and mobile technology to collect meaningful, honest data about their world, in real time. With authentic peer-to-peer insights, Girl Effect and its partners are enabled to make better informed and decisions with greater impact, placing girls’ voices at the heart of the programs that serve them and their communities. TEGA creates a new economy for girls as they become cutting edge, compensated researchers with skills, agency, confidence and economic opportunities for the future. Australia is providing AUD1.4 million over two years to support TEGA. The activity is designed to complement existing Australian-funded programs in Bangladesh by delivering first-hand evidence from communities to enhance program monitoring and evaluation. Girl Effect will work with local partners in Bangladesh to help build a detailed evidence base for existing Australian-funded programs, and feed into future policy and program designs. Australia’s partnership with Girl Effect will helps deliver on Australia’s commitment to enhancing women’s voice in decision-making and leadership; and promotes innovative aid investment, building on collaboration, and trialling new ideas and technology. • build innovative, effective and culturally appropriate research model. The Ministry of Family and Social Policies launched the “Turkey’s Engineer Girls Project” (2016-2020) in cooperation with UNDP and Limak Holding (private sector). The Project aims at developing private sector led prototypes for inclusive and sustainable economic growth in the services and manufacturing sectors, benefitting from gender equality mainstreaming and advocacy, and dissemination of the success stories within the public and private sector. The project will concentrate on developing a private sector led support programme to promote female students’ participation in engineering professions and empowering female engineering students. The long-term expected impact of the Project is to increase women’s high quality employment and advocate gender equality principles in the leading services and manufacturing sectors to improve inclusiveness of economic growth in a sustainable manner. There are many activities subsumed under the three components of the Project. – Develop corporate inclusive business models to adopt, implement and advocate gender sensitive approaches . In the scope of the Project and under the leadership of ISKUR, the “Action Plan on Women’s Employment” was prepared by the National Technical Team that was composed of relevant public agencies and non-governmental organizations. Within the framework of the action plan, gender equality representatives at managerial level from 81 Provincial Directorates were determined in order to monitor the processes related to gender equality. The recommendation that the issue of “women’s employment” should be the major agenda item in at least one of the meetings of the Provincial Boards of Employment and Vocational Training to be held in 2017 was reported to the Provincial Directorates for the purpose of considering equality of opportunity between men and women in the studies made by the Provincial Boards of Employment and Vocational Training. In order to increase awareness in social gender equality and work standards, a short documentary film competition was organised across Turkey. From the social gender equality perspective of women entrepreneurship and labour market, analysis reports were prepared in the pilot provinces. Entrepreneurship training programme evaluation trainings were given to 30 JVCs . Social gender equality trainings were given to 50 staff members of the General Directorate of Turkish Employment Agency, social gender equality representatives from 81 provincial directorates and 175 job and vocational counsellors. 400 women in pilot provinces received entrepreneurship training. At the end of the training, micro grant support and mentorship service will be given to 30 women. Currently 400 women receive entrepreneurship training. At the end of the training, micro grant support and mentorship service will be given to 30 women who have succeeded and will have been selected. The project is aimed at supporting sustainable economic growth by supporting Palestinian start-up ecosystems. This project promotes non-regular coding education, establishment of ICT social enterprises, and start-up support programmes through the creation of joint funds. For the successful implementation of this project, KOICA is working closely with Korean start-up support organizations, Palestinian local companies such as Paltel, and international organizations such as UNRWA. Although this programme does not only consider women as beneficiaries, it is expected to provide new opportunities for women in the project area through ICT education and start-up support. To provide primary education with better quality in target areas, the project promotes 1) construction of ICT innovation centers in two primary schools in Nairobi, 2) improvements of the project sites’ environments, 3) dispatching of Korean experts to Kenya in the fields of teaching and learning , ICT innovation, installation of ICT equipment and construction to conduct technical consultations on empowering teachers and enhancing the quality of education, 4) training Kenyan teachers in Kenya, and 5) the provision of ICT equipment. In close coordination with the Deutsche Gesellschaft für Internationale Zusammenarbeit (GIZ) and Samsung Electronics, this KOICA project promotes vocational training for women in electronic industries. It includes establishing practice-oriented training centers such as the Accra Girls Vocational Institute (AVGI), the Pentecost Vocational Training Center (PVTI), and the Don Bosco Youth Network (DBYN). The project also promotes electronic appliance job training programmes. The curriculum for the vocational training programme is developed based on the market demand in the region. The local partners of the project are the Ministry of Education, the Council for Technical and Vocational Education and Training, and the Ghana Education Service. This project won the third prize for the GIZ Gender Prize in 2016. The project aims at fostering 100 female graduates annually and improving the female ratio of the graduates among electronic technical programmes from 4% in 2012 to 30% in 2017.